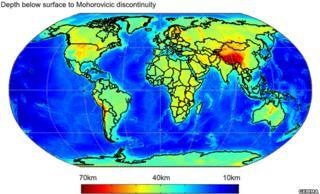 Scientists have mapped the boundary globally between the Earth's crust and its mantle - the so-called Moho boundary - in unprecedented detail. They used gravity measurements from the European Space Agency's Goce satellite to model its location. The famous "discontinuity" lies some 10-70km below the surface and marks a sharp change in rock properties. It was first identified by the Croatian geophysicist Andrija Mohorovicic in 1909. He determined the boundary's existence from the distinct behaviour of seismic waves produced by shallow earthquakes. Goce can be used to sense the Moho's depth because it is able to detect subtle variations in the Earth's gravitational field. These differences result from the uneven distribution of mass inside the planet - a signal that also reflects the major shift in rock density that occurs at the boundary. "At the Moho, there is a discontinuity between the compositions of rock - there are rocks of different density," explainedDr Daniele Sampietro from the Politecnico di Milano, Italy. "The crust has a smaller density while the mantle has a bigger density. And since the change in density means there will be a change in mass, I can use Goce to observe the Moho." The new global map shows clearly that the boundary's depth is greatest under the big mountains, and at its shallowest under the oceans. Today's scientists recognise the interface to be where familiar surface rocks of predominantly basaltic or granitic composition give way to peridotites. These rocks comprise magnesium-rich, silicon-poor minerals such as olivine and pyroxene and are rarely seen at the surface. Getting a clearer picture of where the discontinuity lies will aid the study of plate tectonics, the mechanism that explains how the Earth's rigid outer shell moves and is recycled into the planet's interior. The information is likely also to be useful to those seeking new oil and gas resources, by making it easier to discern deep geological structures. There are places, such as in Cornwall in southwest England, where chunks of ancient Moho have been thrust to the surface, but it remains a key quest for scientists to drill down and retrieve pristine samples of rock from either side of the discontinuity. An attempt was started in the early 1960s (Project Mohole) but was soon abandoned because of the high cost of meeting the engineering challenge. The Gravity Field and Steady-State Ocean Circulation Explorer (Goce) was launched in 2009. It flies pole to pole at an altitude of just 255km - the lowest orbit of any research satellite in operation today. The spacecraft carries three pairs of precision-built platinum blocks inside its gradiometer instrument that sense accelerations which are as small as one part in 10,000,000,000,000 of the gravity experienced on Earth. This allows it to map the almost imperceptible differences in the pull exerted by the mass of the planet from one place to the next - from the great mountain ranges to the deepest ocean trenches.